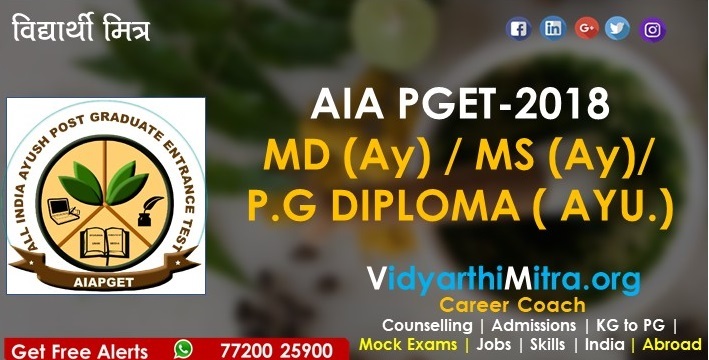 • AIAPGET 2018 is an all India ranking examination for various AYUSH MD / MS / PG DIPLOMA Courses in Ayurveda, Unani, Siddha & Homeopathy systems of medicine. • AIAPGET 2018 will be a single entrance examination namely ‘All India AYUSH Post Graduate Entrance Test 2018’ for admission to Postgraduate AYUSH Courses for the academic session 2018-19 which will include the following: All India (Open/Other states) and State quota seats for admission to MD / MS / PG DIPLOMA Courses in Ayurveda, Unani, Siddha & Homeopathy system of medicine for all AYUSH Colleges, Institutions & Universities/ Deemed Universities across the country. • No any AYUSH Colleges, Institutions/Universities/Deemed Universities shall be conducting any separate entrance exam for admission to AYUSH MD / MS / PG DIPLOMA Courses for the academic session 2018-2019. • AIIA/MoA does not verify the information provided by the candidates during online registration and hence candidature will be purely provisional subject to fulfillment of eligibility criteria as per CCIM/CCH/States/Universities/Institutions/ Deemed Universities concerned. • AIIA / MoA has no role in counselling. 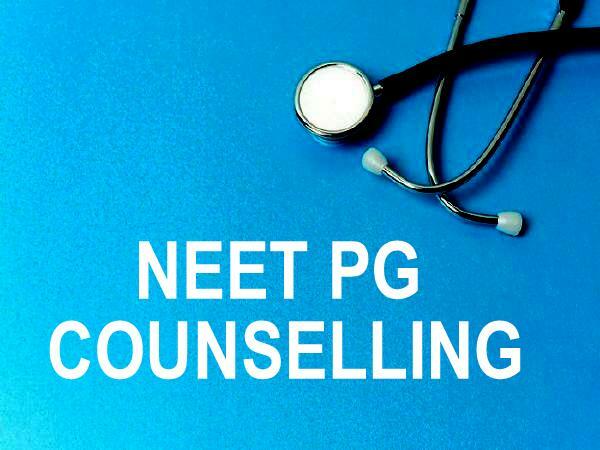 • Concerned State AYUSH Authority(s) / Counselling Authority(s) of the States/UT/ Universities/ Deemed University /AYUSH Colleges/ Institutes will conduct counselling for admission based on candidate AIAPGET 2018 merit, choice of subject and fulfillment of their eligibility criteria, guidelines, domicile criteria, applicable reservation policies etc. AIAPGET 2018 was successfully held on June 24, 2018. AIAPGET (All India Ayush Post Graduate Entrance Test) was conducted by Ministry of AYUSH (Ayurveda, Yoga and Naturopathy, Unani, Siddha and Homeopathy). AIAPGET Result 2018 has been declared on July 19, 2018. Admission to MS/MD courses in Andhra Pradesh based on AIAPGET 2018 score is expected to commence from September 23. All India Institute of Ayurveda (AIIA) will be declaring the results as a combined merit list for All India (Open / Other states seats) / different States / Union Territories/Universities/Deemed Universities /Institutions seats. Incase of tie breaker, candidates inter se merit will be determined according to rules and regulations framed by the respective States/Universities/Institutions. There is no provision for rechecking/re-evaluation/re-totaling of the result/score and no query in this regard will be entertained. Contact State Ayush Authority/State Counselling Authority after declaration of result based on your choice and fulfillment of eligibility criteria. Earlier, admission in PG AYUSH courses was on the basis of NPGET (National Postgraduate Entrance Test). From this year onward, the entrance examination NPGET is replaced by AIAPGET. 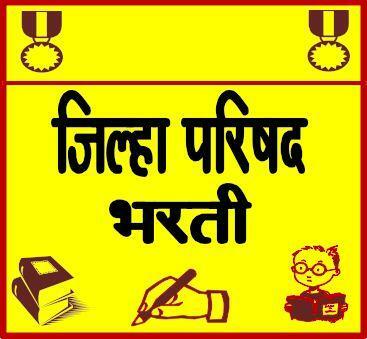 AIAPGET is a national level entrance examination. Candidates who want to take pursue MS/MD courses offered by AYUSH, Government of India need to appaer for AIAPGET 2018. This is the schedule for AIAPGET 2018. All the details regarding the entrance examination are available on the official website (www.aiapget.com) since June 25, 2018. Candidates are advised to check the official website to stay updated on all news and notifications related to AIAPGET 2018. Online registration of AIAPGET 2018 started on April 16, 2018. Candidates can register online by visiting the official website (www.aiapget.com). Candidates should first carefully read the registration guide that is available on the website. AIAPGET 2018 Application Form can be submitted only in the online mode. The conducting authority will not accept offline applications. Visit the official website (www.aiapget.com). Now, click on the link that says “Click here for new registration”. You will be redirected to a new page where you can find the application form. There are 5 steps you have to follow for completing the application process. At first, you need to enter basic information such as your name, mobile number and email ID. Next, you have to upload your scanned photograph and signature. Then, you have to enter your personal and qualification details on the application form. Preview the application form to see if all the details furnished by you are accurate. Candidates cannot make any changes or correction to the application form once they have submitted it. Finally, you have to make the payment of the application fee through debit card/credit card/net banking. The application fee is INR 1750 for candidates under general and OBC categories and INR 1250 for candidates under SC, ST and PWD (PH) categories. The last date of submitting AIAPGET 2018 Application Form is May 4, 2018. Candidates must keep in mind that the application fee is non-refundable. It will take 15 to 20 minutes for candidates to complete the application process. Candidates must gather all the necessary information required to complete the application process of AIAPGET 2018 before starting to fill the application form such as the scanned copy of signature and photograph, debit/credit card details, internship details, educational history, etc. Cut Off marks is the minimum marks that candidates have to score in their AIAPGET to qualify for it. The qualifying criteria of AIAPGET 2018 will be decided by CCIM/CCH and the Ministry of AYUSH, Government of India. If the sufficient number of candidates fail to secure the minimum marks prescribed by the conducting authority, the Government of India may lower the minimum marks for admission to PG courses. Candidates can find the cut off marks of AIAPGET 2018 on the official website after the announcement of the result. Candidates can understand if they have qualified in AIAPGET 2018 examination by checking the cut off marks prescribed by the conducting authority. There are many factors that determine the cut off marks such as number of candidates that have appeared for the examination, average performance of candidates, availability of seats, etc. Candidates who will qualify in AIAPGET 2018 will be called for counselling. AIAPGET 2018 counselling will take place between third week of July 2018. The counselling authority of the States/UTs/Institutes/Universities will conduct the counselling of candidates for offering admission to them. Admission of candidates will be on the basis of the merit list, the choice of candidates and the fulfillment of their domicile criteria, guidelines, applicable reservation policies, eligibility criteria, etc. Candidates should be present in person on the day of counselling with all the mentioned documents. Need More Help In AIAPGET 2018 ? Candidates must possess BAMS/BSMS/BUMS/BHMS/Graded BHMS degree or provisional BAMS/BSMS/BUMS/BHMS pass certificate that is recognized according to the provisions of the HCC 1973/IMCC 1970 Act and possess permanent/provisional registration certificate of BAMS/BSMS/BUMS/BHMS/Graded BHMS issued by CCIM/CCH/universities/deemed universities/state board. Candidates must have completed their one year of internship to be eligible for AIAPGET 2018. Candidates who will be completing their internship before counselling of AIAPGET starts. Candidates must secure a minimum of 50% marks in their UG courses. If candidates are found ineligible, they will not be allowed to appear in the examination despite filling the application form. Candidates who will be completing their internship after AIAPGET 2018 Counselling will not be allowed to give the examination. Application forms of ineligible candidates will be cancelled by the conducting authority. The demo test will also be available on the official website from July 10, 2018. Successfully registered candidates can visit the official website and undertake the demo test to familiarize themselves with the layout, screens and navigation. The syllabus of AIAPGET 2018 will include all the subjects taught during BAMS/BSMS/BUMS/BHMS course as prescribed by CCH/CCIM. The test paper will be consisting of questions of 100 multiple choice single select questions and every question has equal weight. Each question is allotted 1 (one) mark for the correct response and (-) 1 mark will be given for incorrect response of each question. No deduction from the total score will be made if no response is indicated for a question. Syllabus is very lengthy as it covers entire graduation study course material of BAMS, BHMS, BSMS and BYMS. Kindly note that by registering for AIAPGET 2018, candidates are covered by Non-Disclosure Agreement (NDA). Under NDA candidates are bound to not disclose any question or contents of question paper in part by any mean or in any condition. In case candidate is found breaching NDA, it will be deemed as punishable act and strict action will be taken as per the rules and agreement. 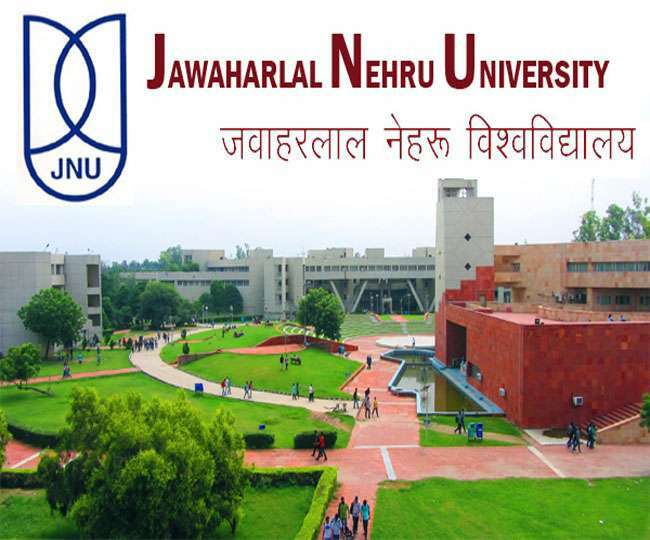 Please check the Admit Card carefully for your Name, Paper, Date of Birth, Gender, Test Centre Name, City, State Code of Eligibility and Category. In case of any discrepancy, communicate to examination authority of AIIA (All India Institute of Ayurveda) immediately for necessary action. Official email for catering issues related to AIAPGET is aiapget@gmail.com. Candidates are advised to reach the venue at least 1½ hours before AIAPGET 2018 examination so as to complete the registration formalities and 15 minutes’ exam demo process well before the time. Registration desk will be closed 15 minutes prior to the examination. The candidate must show, on demand, AIAPGET 2018 Admit Card for admission in the examination room/hall. 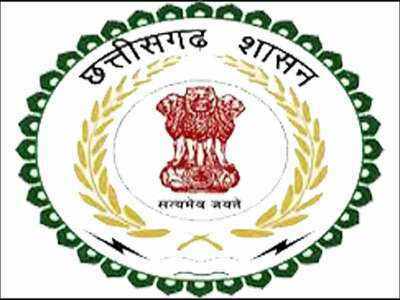 A candidate who does not possess AIAPGET 2018 Admit Card issued by the Board shall not be permitted for the examination under any circumstances by the Centre Superintendent. Candidates claiming the relaxation under PwD category must carry with them the copy PwD certificate in the prescribed format (Appendix 9) issued by the Competent Authority. No candidate, under any circumstances, will be allowed to enter AIAPGET 2018 Examination Centre after the commencement of AIAPGET 2018 examination. No Candidate will be allowed to carry any baggage inside the AIAPGET 2018 Examination Centre. AIAPGET Apex Board will not be responsible for any belongings stolen or lost at the premises. Candidates are not allowed to carry any textual material, Calculators, Pen, Slide Rules, Log Tables, Electronic Watches with facilities of calculator, printed or written material, bits of papers, mobile phone, pager or any other device, except the Admit Card, identity proof, document as required. Smoking and eating are strictly prohibited in AIAPGET 2018 examination room. Tea, coffee, cold drinks or snacks are not allowed to be taken into AIAPGET 2018 examination rooms during examination hours. Approach the Centre Superintendent/Invigilator in the room for any technical assistance, first aid emergency or any other information during the course of AIAPGET 2018 examination. No candidate, without the special permission of the Centre Superintendent or the Invigilator concerned, will leave his/her seat or AIAPGET 2018 Examination Room until the full duration of the paper. Candidates must follow the instructions strictly as instructed by the Centre Superintendent / Invigilators.